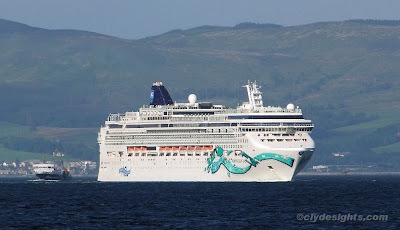 On a Round Britain cruise, which started at Southampton on Sunday 31 May and will finish there on Saturday 13 June, NORWEGIAN JADE was seen leaving the Clyde on Saturday evening, dwarfing CalMac's JUPITER as she passed Ashton. This is the cruiseship's second visit to Greenock, having previously called last summer. From the Clyde, the 93,558 gross ton NORWEGIAN JADE was heading for Invergordon.